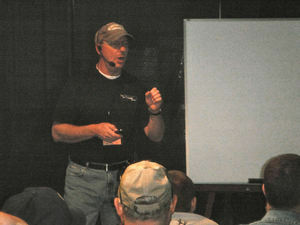 "Over the past ten years I have seen roughly 60 presentations to different fly clubs. This by far was the best organized and well presented fly fishing program I have ever seen." "One of the best presentations ever." "I learned more about dry fly fishing tonight." "I wish I had seen this years ago, I would be a better fly fisher today." "The 'how to' of dry fly fishing connected to the filming was superb - a great learning tool." "Not just a 'show' of where to fish, but where on the water to find fish and how to present the fly all supported by live action filming. Wow!" "I have now changed the way I approach the water when dry fly fishing." If you're a member of a fly fishing club or responsible for a fly fishing show, please contact us for our rates to present at your venue.